Your target audience is bombarded with information by brands all the time. How do you ensure that your messages are taken seriously and acted upon? Influencers can help you get there. Most people think that working with influencers with the biggest possible following is the best way to generate brand awareness. But, hiring a local celebrity chef to tweet about sports shoes is not going to drive much online traffic. It all begins with finding the right influencers in your niche. However, finding the most fitting influencer is easier said than done. You may have to dig a little deeper and use multiple metrics to find the right influencer. This post will tell you exactly how to look for this needle in a haystack. If you have been in social media marketing long enough, you probably know that people with millions of followers may not necessarily be influencers. 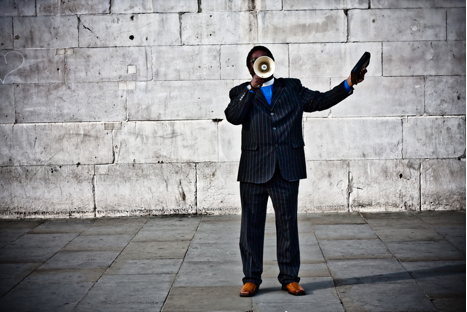 Ideal influencers are the people who can sway the purchasing decisions of their followers. Usually, micro-influencers are influencers with less than a million followers. Though micro-influencers have modest followings, they have greater engagement and visibility. According to a study, nearly 82% of consumers are ‘highly likely’ to follow a recommendation made by a micro–influencer. This marketing method is a great way to promote your product or brand, particularly for small and medium businesses with a limited marketing budget. The first step to finding micro-influencers is to list the topics related to the industry in which you want to find them. For example, if your company sells organic food, you can look for local restaurants serving organic food or grocery stores selling it. The best way to start is by looking for micro-influencers among your followers. Go to your social media account and display all of the followers you have. You can also look for people who your followers are following. Once you have shortlisted the micro-influencers among your followers, check their accounts to see who they are following. Finding local bloggers in your niche is also a great way to identify influencers, particularly if your business or brand serves a particular geographical area. Whatever topic you are searching for, chances are, there are thousands of people blogging about it. It is, therefore, easier to look for local bloggers writing on the topic relevant to your niche. Though some search engines are dedicated to blogs, Google is the best place to start. 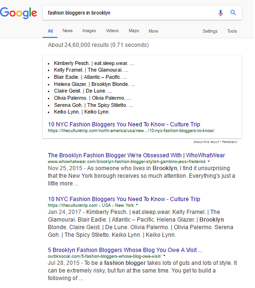 Besides, if a blog shows up in a simple Web search on Google, it probably is authentic and has a substantial following. Repeat this process until you run out of keywords that are relevant to your blog’s topic. Add the blogs you like to your list, including the details of the blogger such as name, email, and social media address. The end goal is to look for blogs with the maximum number of comments and authoritative content. Hashtag research is also a great way to find social media influencers in your niche. This method is particularly used to find influencers that are not your followers, but are talking about products or services similar to yours. 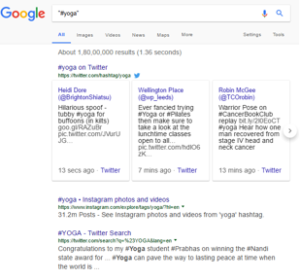 A simple hashtag search on Google is perhaps the best way to start looking for influencers. Be sure to use specific hashtags. For example, if you are running a yoga class, searching ‘#hotyoga’ instead of simply ‘#yoga’ will yield better results. 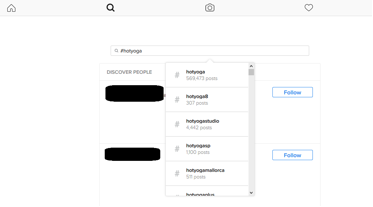 Alternatively, you can search hashtags on built-in search functionalities on individual social media platforms. Instagram is a great place to start. Go through their posts and then check how many followers they have. You can also see if they have a website or a blog. Use built-in search functions on Twitter and Facebook as well. Social media platforms are all about creativity. So the more outside-the-box you think, the better results you will get. Try different hashtags until you have exhausted every single one of them. As stated in the first point, most marketers confuse influence with the number of followers, which is a huge mistake. Industry specific influencers may not have a huge following, but they can alter the purchasing decisions of their followers. Here are a few tips that will help you measure their influence. Make sure the content shared by the influencers resonates with your brand or product closely. Engagement is an indicator of how good the content is. If the content is informative and quirky, the followers will respond, comment, and share. As it happens, there is a direct correlation between how often influencers post and their traffic. So, make sure to publish high-quality posts regularly. In the highly-competitive digital marketing world, getting your brand some serious exposure is a tough challenge. Fortunately, influencers can help you reach your target audience. However, you will be wasting a lot of money and time if you are not using the right influencers. Hopefully, this post has given you a few ideas for finding top-rated influencers in your niche. If you have anything to add, please share your thoughts in the comments below.